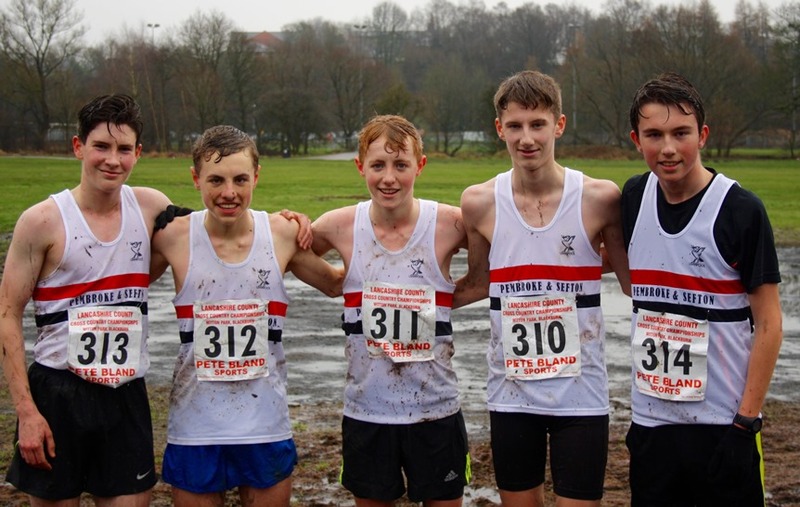 The county cross country championships saw Liverpool Pembroke Sefton once again head in different directions as the Merseyside contingent were competing at a damp Sherdley Park while the Lancastrians were tackling the unforgiving slopes of Witton Park in Blackburn. The club’s Under 17 Men are flourishing and this was demonstrated by double Dan victories. At St Helens Dan Slater took up his first serious challenge of the season against some tough Wirral and Liverpool Harrier opponents. The first lap saw a clutch in front nervously eyeing each other. Slater was saving his challenge for a hill on lap 2 but sensing an earlier weakness he took immediate command and rapidly opened up a fifty yard gap. The rest quietly settled for runners-up as he came home untroubled. Joe Gordon ran strongly for tenth. At Blackburn a similar scenario was being played out but this time it was Dan Jones who was the star turn. On paper he was predicted a bronze but like his counterpart in the Merseyside event he sensed his moment and when he challenged the rest simply capitulated. Not just the club but the broader athletic community is waiting the head-to-head of the dynamic Dans duo,almost certainly, at the forthcoming Northern Championships. There was additional joy for LPS as the strong backing of Adam Jones(7) and Ross Harrison(8) took team gold together with James Metcalf(15) and Glen Sherwin(16). At Sherdley the effervescent Kirsty Longley ran strongly as usual in the Women`s race for bronze and with a powerful performance from Helen Sahgal on fifth and courageous runs from Lisa Gawthorne(18) and Vicky Jones(19) the silver medals were secured for the second successive year. Kirsty Mackenzie was 47th. There was a scattering of results elsewhere, the Under 13 Girls had Faye Hannaway(10) and Niamh Doyle(22) and Adam Oakley a good eighth in the parallel Boys race. Similarly the club had only Lois Owens(14) in the Under 15 Girls. It only remained for the Senior Men to complete a team led by Mark Wynne on a respectable 15th, a strong Bernie Murphy on 35 plus Chris Pedder(45), a runner-up in the O55 class, John Halson(50), Danny Gilbody(63) and Robbie Wood(79). There was a decent turn out in the Lancs. The success of the Under 17 Men has led to encouraging responses from their Under 15 equivalent and they took bronze in their team race with Tom Dickinson(4), Tom Hankin(9), Oliver Sutcliffe(17) plus Matt Russo(27). The U13 Boys almost made it to the medal podium but had to settle for fourth team, Mark Roberts(6) excellent as usual, Tom Ralfs(19), Nicholas Usher(23) withJack Hitchmough(34) and Shaun French(43). At Under 11 Boys the club had James Roberts(27) and Josh Price(29) and at U13 Girls there were Gabby Morris(22), Kate Sutcliffe(40) and Olivia Morgan(44). LPS had a couple in the U15`s, Amelia Hitchmough(17) and Fran Price(26) and two also in the U17`s, Morag Molyneux(10) and Flossie Dickinson(12). 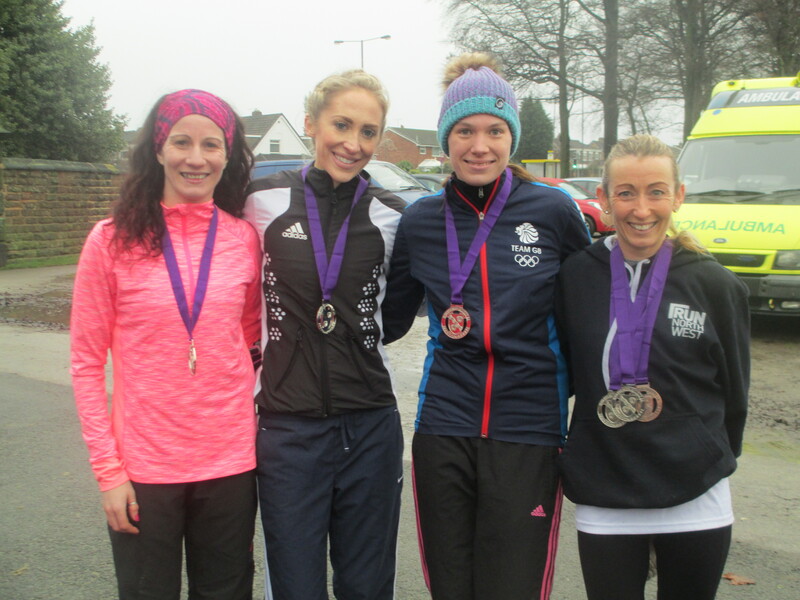 Corinne Molyneux (7) was the sole member in the U20 race.